Justin Kretschmar, Teledyne Oil & Gas,explains how the current economic climate is being addressed by re-engineering products and aligning the supply chain. For the oil and gas industry, 2014 and 2015 will be remembered as the turning point of the ‘new reality,’ where low oil prices pushed producers to slash expenditures and caused organisations to cancel projects due to funding concerns. Although companies had to quickly transition into ‘survival mode,’ there was a silver lining: the new economic climate required the industry to think differently about the way it manages capital, develops new products and processes, and operates businesses. Teledyne Oil & Gas, along with many other companies, recognised that simply cutting costs and waiting for the recovery was not going to be enough to ensure the industry’s long-term health. In late 2014, the company began addressing the unexpected economic change with an approach that innovative thinking was necessary in order to withstand the headwinds. While it is not a simple task to make fundamental shifts in the processes of a well-established organisation, these moments of uncertainty led to golden moments of opportunity. The company questioned long-held assumptions about the way it conducted its business and kickstarted Project 2020, which targeted three major impact areas to make quantum-leap changes, which included: partnering with customers and suppliers during early project phases, leading the effort to optimise equipment and product specifications, and investing in new technologies for life-of-field cost reductions. These three target areas are fundamental initiatives that are lowering costs for our customers, and in turn, changing our industry for the better. Project 2020 represents the company’s vision for the future of project execution. This initiative includes what the company believes is sustainable not only for its market under the current conditions, but prepares the business for future conditions. This is a vision, not a timeline. The transformation of the way projects are executed is happening now. Figure 1. 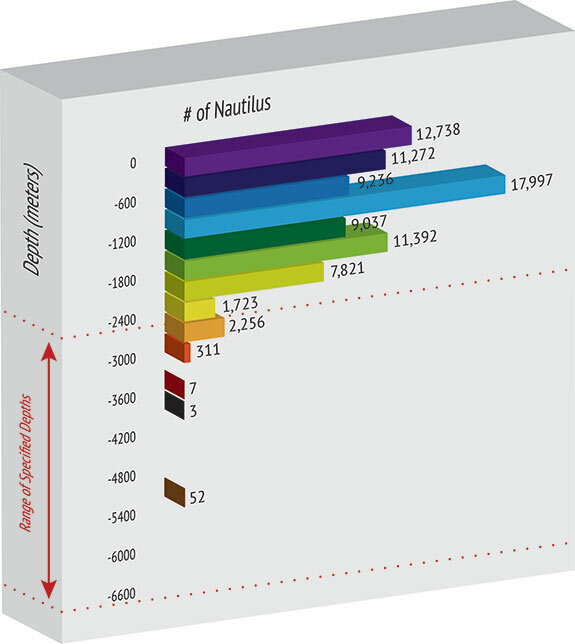 Actual deployment depths of delivered Nautilius connectors. To accelerate a new way of thinking, the company examined other industries that have experienced similar economic patterns. For example, the automotive industry of 2008 focused on reducing costs, consolidating product offerings, and transforming competition into partnerships. As a result, all indications suggest that 2016 should be a record-setting year for new car sales, and dealerships appear to be fully recovered from the recession.The company researched methods, efforts, and success stories from this adjacent industry to brainstorm and apply best practices. It also collaborated with experts from the automotive industry to develop unique solutions for the most challenging logistical problems. The second task was to analyse the cost of products, and address the entire project process, across the entire supply chain. It was discovered early on that only half the cost of a typical project is related to material and labour of the finished product; the other half was comprised of engineering, documentation, testing, quality time, and logistics. This analysis allowed each of these activities to be examined in a new light, facilitating a close partnership with customers to share this data to facilitate collaborative changes. In major oil and gas projects, specifications and requirements are often determined early in project development through front-end engineering design (FEED) studies, before a hardware or service supplier, is involved. Late-stage and mid-project changes to specifications often occur, and the re-work to address these changes is time-consuming and costly. The cost of these types of mid-project changes can more than double the overall cost of the project. This analysis provided justification for our goal of having increased communication earlier in the project development process, in order to collaboratively reduce the possibility of changes. The company approached this early communication by identifying gaps in the FEED study process, where operators do not necessarily have the information about new technologies that can reduce cost or complexity of fields. Working together with customers, early conversations about project scope, performance specifications, and potential issues reduced the chance of costly changes down the line. It is the company’s belief that industry-wide, these new collaboration models between operators, engineering companies, and suppliers must be formed to increase the odds of avoiding these late-stage changes. This is best illustrated in a recent case. Teledyne Oil & Gas worked with a major subsea operator on a field layout design that included multiple electrical and optical connections.The original scope of the field included a series of router modules to convert the signal from electrical to optical, and the organisations collaborated during design phases to share the vision and scope of the project. As a result of these earlier collaborations the two organisations developed a new technology, in which the signal conversion takes place within the connector assemblies. The operator was able to eliminate the router modules from the field architecture altogether, lowering costs and significantly reducing risk. Figure 2. 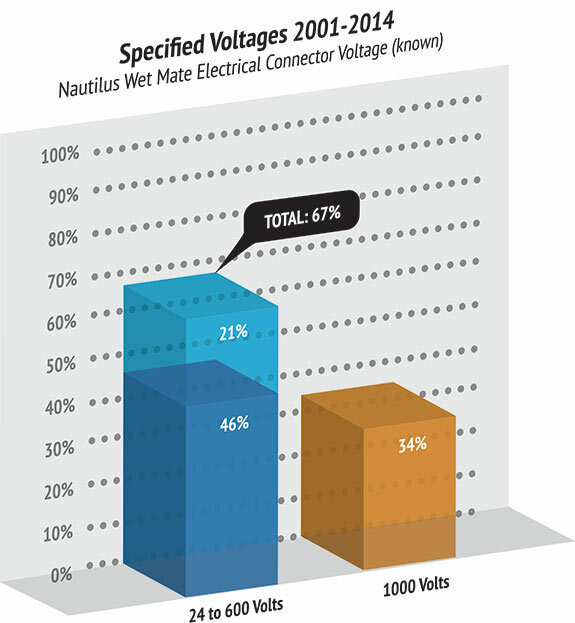 Comparison of actual operational voltages for delivered Nautilus connectors. Consider this: is the oil and gas industry requiring a Formula 1 racecar to simply deliver the mail? The industry has been gravitating toward specification standards for subsea equipment. The company’s technical team worked with operators to challenge industry specifications, and examined the implications of more closely matching the standards and specifications for each project. Offshore projects are characterised by unique environments, whether it is extreme depth, high-operating voltages, large differential pressures, or harsh fluid exposure. There is always a combination of these challenges. The company focused on analysing customer requirements using new methodology. Optimising specifications for each subsea project, rather than following an industry-standard specification, requires adopting increased levels of collaboration across the entire supply-chain. Some examples include: using reliability data to find over-engineered products and processes, inviting both vendors and customers to challenge the entire system, rather than being just a component supplier, and developing new products to reduce the cost of the entire field should be considered best practice. To reiterate this article’s previously described efforts, these types of best-practices require complex conversations to occur early in the project definition phase to optimise the entire solution. To highlight this point, consider this example: in recent subsea projects, the default performance specification for subsea equipment is set at a high standard, such as 6000 m. The actual deployment may be in less than 2000 m of water (Figure 1). The additional cost to test to these higher specifications may not be value-added, if the products will never see such operating conditions. Similarly, field data shows that over half of the Teledyne Oil & Gas connectors sold are used for 24 to 600 volt applications, instead of the 1000 volts for which they are rated (Figure 2). A similar concept applies here as well: if product requirements were reduced to merely the operating conditions, less-expensive products can be delivered due to reduce costs to the customer that would have been previously used for testing, documentation, and engineering time for the extraneous operating conditions. By participating in the FEED studies, companies can help create processes and filters to better match the requirements with the technology available. This approach can be applied to not only system design, but product testing requirements, as well. Analysis shows that extended factory acceptance testing (FAT) for subsea products is becoming more prevalent in offshore projects. Extended testing accounted for over 30% of the products our customers purchased in 2014, causing increases to their costs of nearly 20%. The data indicate that extended testing may not add any value to the product. By challenging industry conventions, and taking a proactive approach to gathering and communicating data up and down the supply chain, joint decisions between suppliers and customers can be made to optimise products and services to best fit the project requirements; thus avoiding adding unnecessary features, testing, or administrative functions. In the new economic climate of the oil and gas industry, research and development (R&D) budgets are tight, and investment into new technologies can suffer. Historically, the entire oil and gas industry has transformed through technology, and without it, those that cannot keep up have reduced chances of survival. New products in the offshore industry are going to be key to optimising subsea infrastructure and reducing costs. Even now, the industry is developing solutions that can significantly reduce system complexity, utilising existing systems, increasing step-out lengths, and handling higher pressures. New technologies will allow the flexibility and the tools to rethink the traditional field layout, resulting in new possibilities that could also potentially have fewer connection points, less hardware, and increased reliability. The Active Flying Lead product family is one such example. A subsea flying lead connects subsea hardware to transmit power and data. By rethinking the role of this component, new technology was developed to embed functionality directly into the flying lead itself. This allows the extra sea floor modules and extra connection points to essentially be removed from the field. This development originated from early collaboration on field architecture development between suppliers, operators, and engineering companies. The offshore oil and gas industry is driven by collecting, analysing, and reporting data: test results, manufacturing records, certifications, and order records. Now is the time to rationalise the data-related processes, and take the time to understand how best to optimise the collection, synthesis, distribution, and storage of the information. Investing in tools, processes, software and new technology may be a hard sell in times of cutbacks and project delays, but careful analysis over a project ‘lifetime’ may show that labour savings or avoidance of re-work can far outweigh implementation costs. The company has invested in custom configuration software to make it easy for customers to order wet mate connectors with a few clicks of the mouse. An online drag-and-drop interface with pricing and part numbers will save time and rework as customers can quickly obtain budgetary pricing, easily communicate their order requirements to quoting staff, and receive a quote shortly upon completion of the configuration steps. These are the types of investments organisations should be making now to ensure that interactions with customers are efficient, timely, and transparent. The time is now for organisations to apply the principle of automation to the industry, as a whole, by making the required infrastructure changes. The results could be an automated capture of ordering, testing, or manufacturing information, with data portals for customers, suppliers, and engineering companies to access real time project updates. Changes like these will result in a leaner industry that operates more efficiently than ever before. As 2016 continues, the oil and gas market is seeing signs of a potential recovery and positive indicators that the price of oil will continue to rise as the industry heads into 2017. It is clear that this is the time to act, making sustainable, strategic changes in our thinking, our assumptions, and our processes. Strong partnerships throughout the industry, deliberate optimisation of specifications, standards, and testing, and thoughtful investment in automation and data management will allow the industry to enter a new era of efficiency, profitability, and long-term security.